I have always been that person with big aspirations. Always working on something and planning 10 other things at the same time. I’m currently creating content for three Youtube Channels and two blogs whilst taking care of two kids under the age of two. I’m sure you’re thinking I’m either magic or insane, I’m neither (well maybe a bit insane). 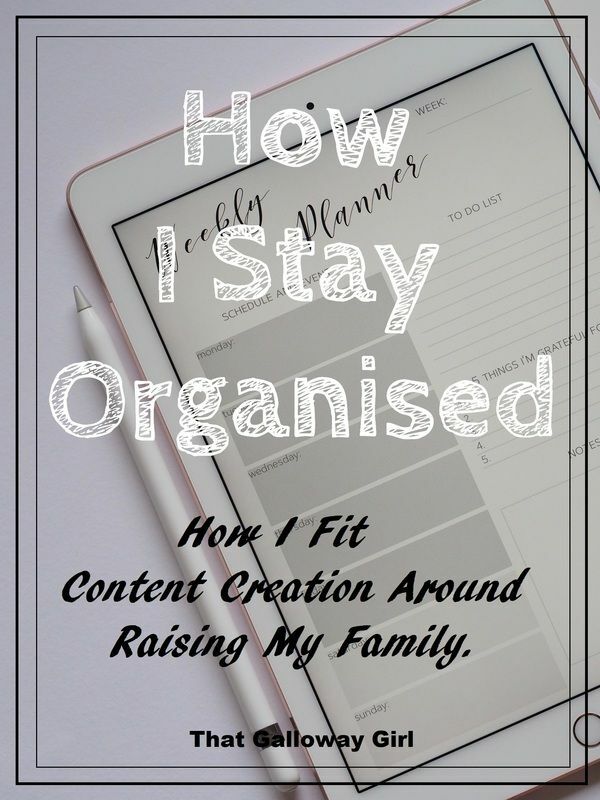 What I am is organised. Before I even get started I have to know what I want to achieve. I always like to plan ahead and often I will plan 3 months ahead of time. I map out the content I want to produce and when I want to go live. Being able to see everything neatly plotted out makes it so much easier to track your progress. Most people set themselves up for failure by trying to take on too much at once. Setting lofty goals and not achieving them is discouraging and after a few instances, it can be enough to make you want to give up. The key is to break things down into bite-size chunks. Take your master list of tasks and break them down to 2-3 tasks a day, or focus on just one a day if you want to take it slow. Be honest with yourself about how much time you have and how long each task will actually take. During the planning stage, I like to make notes. Bullet points of information for each blog post I’m going to write. Because I do all the planning days in advance I want to make sure I don’t forget anything important. It also helps save time when writing. These little plans act as a roadmap so I know where my post is heading and if I lose my train of thought I can look at the plan and work out where I was. I’ve come to learn that certain tasks can only be completed at certain times of day. I edit videos in the morning, film when my partner is there for back up and I mostly write when the kids are asleep. This creates a nice timetable for me to organise my tasks into so I know what I’m doing and when. Isolating your focus like this means you can dive in and give it your all and ultimately get more done in the time you have. With having kids I often have bouts of Mum Guilt. They’re young and I should be spending time with them instead of working, but if I play with them I won’t be getting work done. It’s a bit of a rock and a hard place situation. So I always make dedicated time for them. Even though I think Luna might still be too young to understand, I explain to her that mummy is working and that it’s important. Sometimes I’ll put on her favourite show so she doesn’t feel like I’m ignoring her. And when I’ve completed my task I go and play with her half an hour or so (to be honest she gets bored of me after that) and then I go on to my next task. The most important factor that enables me to do what I do is having the support of my partner. He knows this is important to me and that all the work I do is in the hopes of benefiting our family. He watches the kids while I work or goes out with Luna so she gets the undivided attention she needs (she loves going to the shops with Daddy). He also knows not to distract or interrupt me while I’m working. This is really important when I’m filming, it’s very difficult to convincingly fake a happy mood so avoiding any frustration is a must. So there you have it. I don’t do anything special or have lots of time to myself, I’m just very organised. I realised there was no point in waiting for the “right time” to pursue my goals, there may never be a “right time”. I had to make it work and this is the method that seems to work best for me. I hope there are some tips that you can take away to make your day easier.